ULAA + BP Collab Happy Hour Mixer | "¡Lotería!" 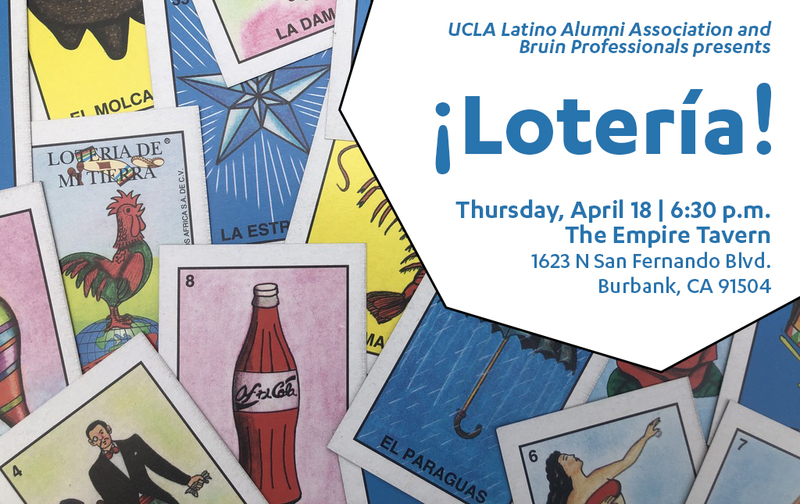 Join UCLA Latino Alumni Association (ULAA) and Bruin Professionals (BP) to try your luck at the traditional Mexican game of chance with origins from Spain – Lotería. Mix and mingle while indulging in special happy hour pricing on craft beers and delicious food at Bruin-owned The Empire Tavern in Burbank. 1623 N San Fernando Blvd. Suggested donation of $10 upon RSVP. Space is limited so RSVP quickly!